Combine the steak sauce with the spices and pour over the round roast. The next day brown the round roast in some bacon grease in a cast iron skillet (or in your dutch oven if you wish). Place the browned round roast in the dutch oven, add the beef broth to the dutch oven and put the lid on. 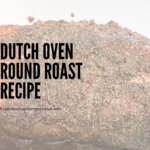 Place the dutch oven inside the oven and preheat it to 325 degrees Fahrenheit. Cook the round roast for 2 1/2 hours. Note: This is a fairly spicy recipe. For those who do not like spicer foods, feel free to cut the amounts of spices in half to better suit your palate. Also keep in mind the steak sauce you use will add additional flavor. For those who do not like spicy food, I suggest only using steak sauce and not using the other spices.